Cigarette Burns Cinema is proud to present a special preview screening of Metrodome Distribution’s upcoming release THE INNKEEPERS. 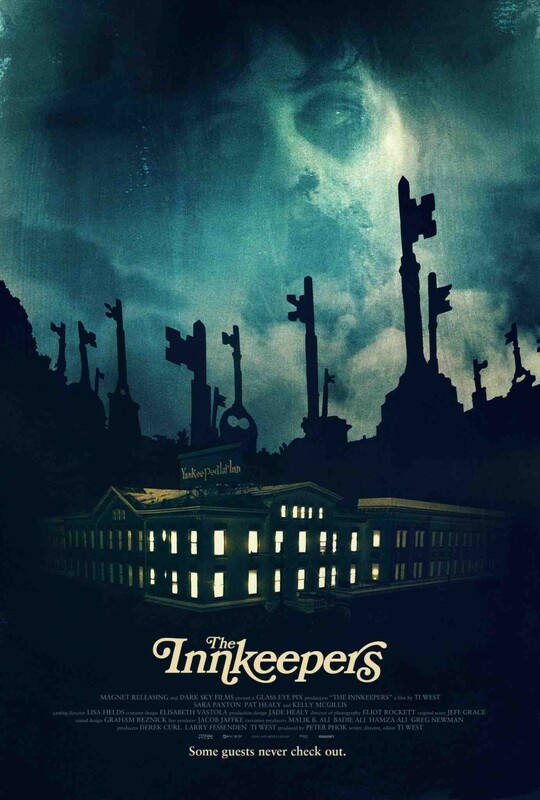 Originally premièring in the UK as one of the favourites of Frightfest’s 2011 line up, The Innkeepers a modern classic as much as it is a homage to films before it. Innkeepers, wherein, two directionless wage slaves at the near to closure ‘Yankee Pedlar Inn’, hoping to distract themselves from the tedium of their minimum wage woes, determine to uncover evidence of the hotel’s vaunted hauntings – only to very much wish they hadn’t. Writer/Director/Editor Ti West has cultivated a recent reputation as a film maker who cares about craft; his ‘slow burn’ aesthetic in complete contrast to the current crop of lowest common denominator, attention deficient body count blockbusters and remake rehashes. His attention to detail and the shimmering production values which emanate from his continued insistence to shoot on film, fly in the face of the post-Blair Witch “Found Footage” film trend. Written while still licking his wounds from the tortured experience of writing/directing medium-major studio movie ‘Cabin Fever 2’; West was inspired by the uncanny events experienced by cast and crew while staying at the real life ‘Yankee Pedlar Inn’ in Torrington, Connecticut – base camp for the location shoot of his previous indie production, the 80s Satanic period piece ‘House of the Devil’. Fascinated by the ilk of TV’s ‘Most Haunted’, with its phoney psychics and their hi-tech honchos failing to uncover evidence of phantom phenomena on a weekly basis, West pondered how they would actually cope when confronted with the incontrovertible. Written in three days, West’s script creates a convincing portrayal of that specific workplace chemistry of colleagues thrown together by necessity, but which rarely develops into any form of extra-curricular relationship. A scenario, which could have easily generated Kevin Smith-levels of annoyance, is instead deftly handled with a degree of unforced charm by the warm and natural performances of the appealing leads. Tween movie star Sara Paxton, acting against glamorous type, imparts her character Claire with an unexpectedly awkward, goofy charm; while Pat Healy’s dryly-humoured cynicism fails to conceal his character Luke’s transparent and literally hopeless proximity-crush on the much younger woman. The lives of the few remaining residents of the Hotel; a single mum, an elderly widower and a faded actress-turned-new-age-spiritualist give warning to the possible fates awaiting the duo if they continue their drifting lives. Kelly McGillis, as fallen movie star Leanne Rease-Jones (partially inspired by ‘House of the Devil’ co-star Dee ‘E.T.’, ‘The Howling’ Wallace), gives a slightly sour, but vulnerable performance one would not have predicted from her days in ‘Witness’ or ‘Top Gun’. No ghost movie is complete without its haunted house and this “Slacker Shining” (© Mark Pilkington) is no exception. Perhaps this movie’s greatest performance is the ‘Yankee Pedlar Inn’ itself, in the role it was born to play. For a movie where the scares are as much heard as seen, it is fitting that much of the mood is via the mix created by sound designer Graham Resnick. Minus the impossible architecture of Kubrick’s other famous haunted hotel, West creates an creeping anticipation of terror via slow dolly shots, pauses and clever framing – transforming the homey, rustic charm of the 19th Century hostelry into an environment where every innocent corner hides a wrongness. Watch The Innkeepers with us at The Prince Charles Cinema on 24th May details here. I loved watching this movie so much so i went to the theater twice lol.Great review by the way.